Request a quote for your horse's next journey: info@horsejitney.com or call or txt me at 301-526-8273. Hi! My name is Athena Haresign and I'm a fellow equestrian, horse breeder, and veterinary technician with a passion for all things horses and animals. I maintain memberships with the United States Equestrian Federation, The United States Dressage Federation, and the Oldenburg Registry N.A., but I have ridden competitive hunters and jumpers, as well as enjoy fox hunting. I like horses regardless of breed, color, or discipline and very much love it when my clients take the time to introduce me to the intricacies of their breed or discipline, and especially the stories of what their horses mean to them. I grew up in Southampton, NY (the very eastern end of Long Island) volunteering at the Hampton Classic Horse Show and working in local barns like The Topping Riding Club and Swan Creek Farms. As a kid I was very lucky to work with and around many different horses and have some of the most knowledgeable people like AFA certified farriers Dave Birdsall and Burney Chapman who willingly disseminated their pearls of wisdom to me, this horse-crazy kid who persisted in peering over their shoulders. I realize now what a gift it was and how much they taught me as they so generously explained the how's and why's things worked or didn't work. Both were entrepreneurs as well as truly passionate about their trade and horses, and it was a true gift being around them when they were deeply involved in solving a problem. I have always loved horses, and had the unique pleasure of meeting really cool jumpers when I was just a teenager like Idle Dice, Calypso, Abdullah, and so many others, not to mention their people at the Hampton Classic, and I was forever fascinated by the process of shipping and caring for them on the road. I spent many a day sitting on my horse on the village green watching the beautiful rigs go by on Montauk Highway en route to the show. I wanted to be part of it; I was fascinated. I'd go to the show and wander through the tents, visiting the horses and helping anyone I could if they'd just let me pet their horse. I seldom watched the classes because for me it was all about the horses and the experience behind the scenes. I have since shown my own horses at the Classic and other big shows and I still love wandering around the barns and meeting the horses and their people. I remember one day sitting under Dave's farrier tent at the Hampton Classic watching him shoe a horse and he stopped in mid-nail and said, "see that? ", I turned and looked, "That's like watching God ride". It was Rodney Jenkins riding Idle Dice in the schooling ring. You could have heard a pin drop for that moment while we watched him sail over this giant practice fence. Even the horse Dave was working on seemed to take a deep breath. But like all good passions, they have to wait until the right time, which for me was after I'd already had a full, adventurous career. I have spent most of my life in the veterinary industry as a veterinary technician, practice manager, electronic (digital nowadays) medical record and practice management technology consultant, technology consultant to pharmaceutical companies, and finally ending that career as the co-founder of VetInsite where I was the visionary and Vice President, creating Pet Portals which you may be using today to access your pets' medical records and interact with your veterinarian over the Internet. Yep, that's me! VetInsite was sold in 2006, and ultimately the Pet Portals were sold again a couple years ago, but still today what we created with a small, awesome team of developers between 2000 and 2006 continues to help pet owners keep track of their pets' vaccinations, medications, learn more about their pets' health conditions, and communicate with their veterinarians. So what does one do after changing the way veterinarians, pet owners, and pharmaceutical companies interact and collect data? 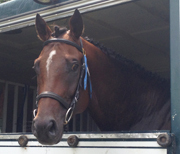 Start a horse transportation company to fulfill that childhood dream! I was further inspired to get involved in the process of shipping horses when my own horse Cody, the same one that Dave inspired my parents to let me have, had one of those nightmare trailering and loading experiences that scars them forever. I was a kid without a trailer, begging for rides and borrowing trailers to get to horse shows and hunter paces, but it came with a price, and a big price at that. Needless to say, Cody had no intention of getting back on that trailer to go home and it took about six people, a blind fold, a broom, and a lot of swearing to get him back on (I stood back horrified). He became one of those problem loaders everyone hates and it took years to overcome his fear of trailers. I would have preferred a ride that took twice as long rather than have my horse tormented by an aggressive driver. It was a big price to pay for a ride to a hunter pace. This experience was the beginning of my interest in learning everything I could about trailering horses. 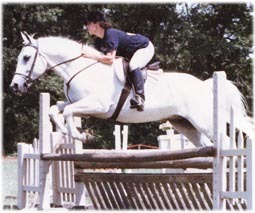 In 1999 I started a very small breeding program (Muddy Paddock Sport Horses) with my foundation mare Seek and Find, a lovely, hunter-type thoroughbred mare who had been badly injured when we encountered a quick-sand type substance along the Patuxtant river in Maryland a couple years prior. She was was sucked in all the way to the saddle flaps, and somehow pulled herself out while keeping her wits about her, but in doing so managed to torque herself so badly out of alignment that there was no putting humpty-dumpty back together again for any type of riding. I began researching everything I could about breeding, trying to remember what I could from college classes and talking to area breeders. I knew I was not savvy enough to breed for racing, but I understood genetics and conformation enough to breed for soundness and athleticicsm. 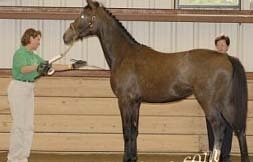 I had the good fortune of working with Angela Barilar of High Point Hanoverians in Maryland to breed this mare to her young stallion Davignport, a Donnerhall son. This breeding got me introduced to warmbloods, dressage sport horse breed shows, and showing hunters in hand as the breeding produced the very lovely Dream Catcher who has been top ten at both Dressage at Devon, and the hunter venue, The Devon Horse Show. I enjoyed showing Dream Catcher in hand, and ultimately competing her under saddle in eventing, dressage, and hunter shows. That intitial breeding led to the production of Fifth Element by Fuerst Gotthard and Dascha by Donnerluck from the same mare. Seek and Find loved being a mother, and absolutely showed off when she attended horse shows and inspections with her babies. She really smiled! Unfortunately her injuries produced chronic ulcers and she succombed to bad colic at the early age of 14 and left as her legacy three very nice Oldenburg fillies. Life throws curve balls that take us in directions we don't anticipate, and while I never anticicpated that I would have a passion for thoroughbreds, but now I find myself in a brand new arena preparing for the 2014 breeding season with a lovely thoroughbred stallion Full of Scoundrels who I expect will produce fantastic, sound athletes that will excel in eventing, jumpers, hunters, and racing, and two equally nice thoroughbred mares. In the rare even that I'm not on the road, I work with riders with young horses under saddle and problem loaders. 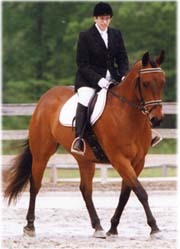 I use gymnastics and dressage to create balanced hunters and successful dressage horses. I help riders understand how to read their horse, and react appropriately so they are not inadvertently restricting their horse's movement. I enjoy the process of putting a strong foundation on a horse rider combination so the rider can focus on her specific discipline as an effective, compassionate, thinking and feeling rider with her regular trainer. I have a good eye for identifying problems, using appropriate exercises to unlock the horse or rider, and communicating the how's and why's of what we are doing and where we are going. Of course every day is a new adventure in my life, so I'm working on trying to compile some stories either for a blog or perhaps even a book. There's so many great stories to tell from meeting so many unique horses, people, and life on the road. If you've read through this then you've probably figured out I'm just a horse-crazy kid in a grown up body. I've had many horses, and been touched by many horses. Each one teaches me something, and I often maintain very strong, long standing connections with those I don't own like Mission Approved who practically takes his stall apart to visit with me when I arrive at the barn. I have no doubt that horses have very, very long memories, and when they are connected with a human or animal, they bond very deeply and in a way that separation does not affect. They may live in the moment, but they form very deep attachments. 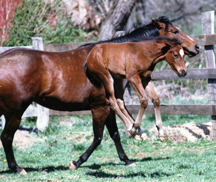 Smoky is the first weanling I ever owned, and in 1988, before the Internet was officially the Internet or commercialized, I found Smoky via rec.horse.net using a vax station at the University of Maryland's computer lab. 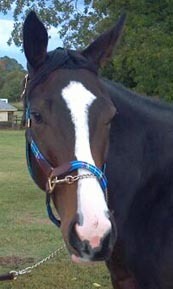 Although Smoky was located in Maryland, the seller's daughter was attending school in Michigan and listed him on the then, very plain text ads. So I guess you could say I've always been an early adopter for the Internet and all it brings to our lives. I bought him for the sheer fact that he shared the same grandfather as my horse Cody who I had for 28 years after getting him as an unbroken recently gelded ten year old when I was just a kid. It was Cody who taught me to ask and listen to the response, working with the horse's apptitude and emotional state as if in conversation and negotiation so the horse comes to the desired conclusion as though his own idea. I have no doubt I bought Smoky probably hoping the genetic similarities would carry over in other ways, but of course they did not. We competed at local hunter, dressage, and event shows, even getting to first level dressage where his lack of a lengthening from his Quarter Horse conformation was off set by his lovely canter and walk. We even routinely put together a quadrille with the Clarksville Chapter of Potomac Valley Dressage Association and showed every year at the Chapter Challenge. Good times were had by all. Smoky became the partner of my good friend Elsie who was entering her last years of riding at the age of 68. He and Elsie shared over ten years together, and one couldn't ask for a better riding companion. 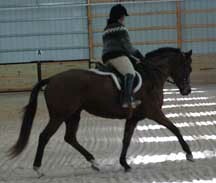 Elsie could take him out anywhere on the trails by herself, take weekly dressage lessons, and show at the PVDA shows. When Smoky came in from the field with a torn tendon and ultimately a tendon sheath infection, she did everthing for him, including sending him to swim, several surgeries, and daily therapy. 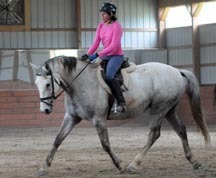 It was because of Elsie's hard work that Smoky became sound again and they resumed their trail riding and even dressage lessons against all odds when veterinarians were adament he would never be sound again. Smoky gave back to Elsie in a way that has earned him a special place in my heart, which is the day they went on a trail ride at Schooley Mill Park on a windy day. A tree came down, knocking Elsie off of Smoky, and in fact knocking her out completely. When she came to, Smoky was standing over her with the tree leaning on him. Had he moved, the tree would have fallen on while she lay on the ground unconscious having fractured her neck in the event. Did it end her riding career? No way! Elsie has since stopped riding, but we share great memories from our trail rides, hunter paces, and horse shows. Elsie is my hero, as she came to riding in her 50's and rode almost into her 80's and was the only person I thoroughly enjoyed riding with as she wasn't afraid to gallop along and jump inviting obstacles, not to mention the great conversations we shared while enjoying nature. I miss our rides together, and have yet to find a riding partner that matches her sense of adventure. though we still enjoy terrific conversations! Smoky is retired with me now, and his job is keeping every horse in line, including the stallion Scoundrels. He is firmly committed to following in his Uncle Cody's footsteps as keeper of the peace in the pasture, and even Kate has accepted his role as King. His Uncle Cody lived to be 38, and I hope Smoky has inherited the same longevity in his genes. Katie is one of those preocious, first born! She knows she's the princess and above the rest just because she was here first, but somehow it works for her! She ruled the roost up until a few years ago when she made the fatal mistake of challenging Smoky when he came home from years away. Big mistake! She was like the little kid sitting in the back seat poking her older brother who finally had enough... and pow, pow, pow... he kicked and she kicked right back... and on it went. Until finally he cracked her cannon bone and the pain stopped her in her tracks. It was probably a blessing in disguise because she never challenged him again and between them they keep peace in the pasture. She would very much like to be a mother, and in fact has gotten away at shows and tried to steal foals from other mares, plus she basically took Radiant as her own when she was born, leaving the mom as just the milk bag. It seemed to work for all involved. When Scoundrels arrived, she was fascinated by him, and would walk her fence line just so she could catch a glimpse of him in his field. Sometimes it seemed she was more the stallion than he, and in fact, she did ultimately teach him how to treat a lady, knocking him to the ground and dragging him by his lower lip when he got a little too fresh. Needless to say, he is, thanks to kate, the perfect gentlman. Now if he'd just get brave enough to breed a mare...thanks again to Kate's teachings. 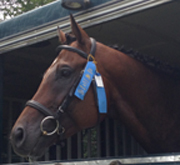 Dream Catcher received a second place all-breeds award from USDF in 2005 and has placed on the line multiple times at Dressage at Devon, The Devon Horse Show, the Fair Hill breed show, Dressage At Lexington, and VADA/NOVA. She's the little engine that could when you ride her! She'll jump anything and just floats over the ground, and she likes to be the star of the show. Libby is a little bit like the village idiot, though beautiful and talented. She never learned the definition of insanity when it comes to repeating the same process and expecting different results. She continues to challenge her pasture mates and acts completely insulted when they repeatedly set her down and remind her she is not to even consider climbing the ranks in the herd. She learns by watching other horses, and is actually quite intelligent, but she's so busy over-analzying things and thinking she knows more than you do that she defines the phrase "patience is a virtue", though I have never met a horse that absolutely just lives to jump things like she does. This mare was not supposed to be mine, but she picked me and wasn't taking "no" for an answer. One of my very best friends, Heather Buras of A Pinch of Luck in Atlanta, Georgia, specializes in finding new jobs for retired race horses and is an expert at matching the right person to each horse. I like transporting for her because I have a personal passion for race horses both on and off the track, and often she finds homes for horses I have shipped and worked with at the track during their racing career. Mckenzie River was scheduled to ship and came with the description "bad loader" which always makes me cringe because most "bad loaders" are just responding to something like feeling claustrophobic, poor handling, a previous bad trailering experience, or just feeling rushed to get on a trailer before they've had an opportunity to check it out. In addition, she came with the label "difficult" in general, which always makes me curious to see if I can connect with the horse. When I saw her in the barn, she was standing at the back of her stall, having already seen the trailer pull up in front of the barn. She was having no part of it. It's sort of hard to describe it as a loading nightmare when all she really did was plant her feet in cement and refuse to budge which only escalated things with the people helping, but it did take three people to basically pick her up and put her in. It was not how I would have preferred things to go, so the entire time I had her on board I tried to make friends with her. Finally she would take a piece of carrot from me. I called Heather and told her I was planning on staying for a couple days and I needed to work with this horse so that when she did get a home this issue with loading would be resolved; I take a great deal of pride in getting horses into the trailer in such a way that it's a repeatable, easy process, so I felt I owed it to the horse to help her get over whatever negative association she had with trailers. We arrived in Georgia and I spent two full days camped in her stall, which made her stomp her feet and look at me with fire in her eyes. She clearly did not approve of having a human in her space! I had brought down these fantastically delicious Macoon apples from New York which were really crunchy and I ate tons of them trying to get her interested, then i'd put pieces in her dish since she still wasn't sure about taking them from my hand. Then the farrier came to pull off her racing plates and she was having none of it, running backwards and kicking at him. Finally she was willing to let me hold her back feet while Heather held her and blocked her from seeing the farrier sneak up and pull the shoes. I guess she started to trust me. Once I had her taking apples and carrots, it was time to talk about the trailer again. I placed bits of apples all along the running boards of the trailer, on the truck hood and bed, and took out all the dividers, leaving both the back and side ramps open. It took about two hours with me sitting on the running boards and her grazing right at my feet to make it all the way to the back ramp, where I sat for a long time waiting for her to get curious. She finally did and by the end we were walking in and out of the trailer like it was never an issue. By the third day, when I'd walk into the barn she would come to her stall door and watch every move I made, but still didn't interact with other people. I started to think "Maybe I should keep her". This is about the time I decided to see if there was a reason for her to be acting so fearful, and it didn't take long to find it. She had torqued her back somehow and the muscles on the right side of her spine behind the saddle were actually so tight they were jumping. I suspect that she had back pain and yet still ran, but fought the trailer because she associated it with creating discomfort. Once I saw that and realized she needed time and some very basic body work to get herself fixed up. Every day when barn folks would ask if I was keeping her, I'd say "Maybe" and laugh it off, and they'd respond "well you better"! So one day I walked in the barn and said "ok, fine, I'll keep her, but I have no idea what I'm going to call her". Heather looked right at me and said "Maybe, of course". I've had Maybe since 2011, and now her back is good, her body is no longer sore, and she has no more trust issues. In fact, when she's not following me around like a dog, she's being ridden by a 12 year old and does whatever she's asked to do, happily, including getting in the trailer. If there's a willing participant she can mug for just about any treat, she will, though she really hates peppermints, unlike most racers who will do anything when they hear a peppermint wrapper! Maybe has a sister who is currently racing in New York, and one of the stallion Utopia'stop progeny, named Jitney, which I think is great since the dam is Take a Taxi and Jitney essentially means taxi. Victoria Pool was the highest priced New York bred 2 year old filly in training out of the the the Ocala Breeders Sale in 2010, showing off to all the bidders her long, powerful stride and having the bullet work (fastest work time) of the day. 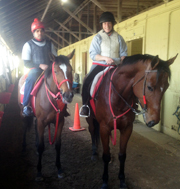 She found her way to Belmont park and began her career as a race horse. She had a huge amount of talent and everyone knew it, which is why my friend had claimed her, but she had quirks to go with that talent like arbitrarily stopping on the track, getting picked up by the van, and vanned back to the barn, where, upon arrival, she would thank the driver for the ride, get cleared by the vet as having no issues, and go back to eating hay. An amusing habit, if you're not the one paying her bills. I didn't spend much time with Victoria at the track, partly because she wasn't a horse who particularly liked interaction. She had a great deal of energy and was hard to train because she was so enthusiastic in the mornings, so she spent most of her days in a paddock where she leaped and played all day long. She wasn't difficult to handle either, as long as you weren't on her back, so I think she sort of got lost in the crowd by being understated, and in fact, I now know that was her intention. She hates drama. When the call came that Victoria was ready to move on to her next career, I immediately put the call into Heather who agreed to take her as a sales prospect. I remember telling her she was a big, understated, pretty mare with a plain, sort of rough face that made you look twice at her to really see her, but other than that there was nothing to say except she was basically easy to deal with on the ground. So I put her on the list to go to Heather's and didn't think any more about it. Somehow between Fingerlakes and my house I found myself fascinated by Victoria and not really sure why. She'd lost some weight and muscle since she'd been at Belmont and really didn't look like much of anything, but I told Heather I was pretty sure she's a diamond in the rough, though I couldn't put my finger on why. She was scheduled to stay at my house for about a week before going on to Georgia, and when the time came to take the group south, I didn't want her to go. I called Heather and said I'd put some more weight on her and she could have her on the next trip, which was just fine by her. Then the next trip came and went and still Victoria didn't leave. Victoria, in her demure, understated way, has gotten under everyone's skin who has met her, and nobody who meets her can explain what it is that makes her so infectious that you just have to like her. She doesn' particularly interact with people, she stays out of the way of the other horses, and she just sort of appreciates whatever you did for her, but never asks for anything. Except she will walk up behind you and tap you on the shoulder, very gently, if you let the other horses out and miscount how many have actually gone through the gate, just to say "hey, what about me". Needless to say, she never made it to Heather's, and I can't exactly explain what it was that made her remain a permanent resident here at Muddy Paddock Sport Horses, except that she smiles when she sees you, and in her understated way she has captured the hearts of everyone. ..and she loves to run. She runs laps around the field just for fun, while all the horses look at her like she's crazy, but you can see it in her eyes, it's pure joy when she's galloping. She just wants to do it her way. In 2011 a young colt named Full of Scoundrels was making a sneak attack on the proverbial Derby trail, but even though he hadn't raced at 2, he hadn't gone unnoticed on the backstretch, so when he was entered in a claiming race to see what he could do, my trainer-friend zipped off to make the claim, knowing this was a very talented horse. Scoundrels ran an impressive race, starting with a poor break and ending with two charges through holes for the win. In his next start out, he was challenged with coming to the stretch three-wide on the turn and making his play, coming in second, but showing every bit of class and stamina he would need to earn his way to the Derby via the Wood Memorial. Even the morning line chatter was talking about him as the bomber who could shake things up since other than Uncle Mo, it was a fairly weak field. But the best laid plans of mice and men often go awry, and that was the case with Scoundrels. A wing fracture of his coffin bone caused him to be scratched from the Wood Memorial that year, a year in which Uncle Mo was slated to win, but didn't, so who knows what would have happened if this sleeper had gotten to race! What started as a tincture of time to heal turned into a life-saving surgery when the tendon sheath became infected and his connections were faced with euthanizing him or attempting the odds and doing a very expensive surgery, knowing the likelihood of him returning their investment was little to none. Scoundrels was such a good patient, laying down often to take the weight off the foot, accepting his confinement with grace and dignity, and never letting his hormones get the best of him that it is probably the reason he healed so quickly and so well. 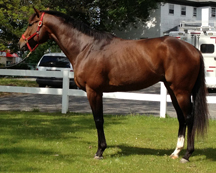 I transported him to the Sue and Jim Hooper's Haven Oaks Farm in Fort Edwards, NY where, under their watchful eye, he transitioned from stall, to round pen, to paddock, coming back very, very sound and growing into a very handsome, well-mannered stallion in need of a job. We all sort of hoped gelding him and transitioning him into a riding horse would be his ultimate fate, but it was not to be. Since his injury, I had tried to help his connections find him a home, but with the economy being what it was, nobody would take a chance on a relatively unproven stallion, though everyone agreed he had the conformation, resume, and pedigree to breed racers, jumpers, or hunters, and the few riding homes I'd found wanted assurance he would stay sound for light riding. I was reluctant to geld him until I had exhausted beating the bushes for a breeding home, since I felt confident that his injury was not a side-effect of poor conformation or bone structure, just produced from a rock on the track given the amount of sole bruising that went along with it. In May of 2013 I decided it was time to bring Scoundrels to Maryland and figure out what his job would be once he got here as his connections had already put two years into his rehabilitation with no chance of returning to racing. Before making the final decision to geld him, I wanted to ride him and see how he felt and see how the leg held up. 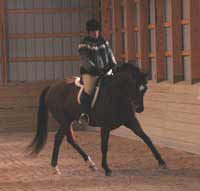 As I rode him, I could feel the limited flexibility and noticed he was sore after he played hard in the field. He was easy to have around the barn, and just loved being around the other horses, just enjoying the company, not getting studdish and stupid around the mares. After much deliberation, I decided to keep him as a breeding stallion as the eventer and hunter people I trust were very excited about his conformation and mind. In preparation for the 2014 breeding season, I took him two of theVADA/NOVA breed show where he was the Stallion champion both days, and double qualified for the East Coast Breeder's Championships at Dressage at Devon. He will be breeding my own warmblood and thoroughbred mares with whom his conformation complements quite nicely for hunters, jumpers, and eventing and hopefully will prove to be a nice sport horse stallion. For those interested in racing pedigrees, Scoundrels' half sister Jazzy Idea, also by Great Notion, was voted the 2012 Horse of the Year for her racing accomplishments by the Maryland Racing Media Association and further affirms the Great Notion side of Scoundrels' pedigree for racing, along with his half brother the graded stakes winner Havelock. In the meantime, Scoundrels is enjoying life at the farm. Unlike the larger farms where stallions only see mares to breed, Scoundrels lives with his very own mare, Victoria Pool, shares the barn with all the mares, and is never without company. He is, in fact, the best mannered horse on the farm, with absolutely no pretences or expectations, just happy for any attention that comes his way. Hopefully he will make his mark on the world via his progeny, but if not, he certainly leaves an impression on all who meet him with his lovely temperament.